Wise and practical prescriptions for how to live with an honest perception of reality can become a companion for your own spiritual journey. 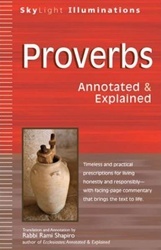 More than commonplace truisms, the biblical Book of Proverbs is an anthology of teachings designed to help you live with a sense of self-responsibility. Its wisdom, compiled in the seventh century BCE and credited to King Solomon, transcends nationality and politics, addressing instead the individual seeking the true satisfaction and tranquility that comes from living with an honest perception of reality. 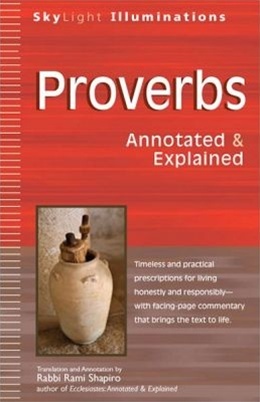 In this fresh translation of an ancient “how-to,” Rami Shapiro unpacks the proverbs, demonstrating how these complex poetic forms are actually straightforward instructions to live simply, without rationalizations and excuses. He shows how unlike almost anything else in the Hebrew Bible, the truths claimed in the Book of Proverbs are testable and verifiable. They force us to examine our lives and how we are living them without the benefit of psychological sophistry and New Age babble: We are either doing good or doing bad; we are either disciplined or lazy; we are either students of wisdom or puppets of desire. Now you can experience the Book of Proverbs and understand Solomon’s teachings with no previous knowledge of the Hebrew Bible. This SkyLight Illuminations edition presents insightful commentary that shares these timeless principles and encourages us to put them into practice in ways that are uniquely our own.